Occasionally, we have to miss singing time due to family functions, vacation plans, illness, emergencies, the list goes on. So what do you do when you are in need of a sub, either last minute or something that has been planned out well in advance? It should go without saying that the more time you give others, the more willing they will be to help you. Don't make your failure to plan, their emergency. If you know in a few weeks that you will be out of town, now is always the time to start looking and preparing for a substitute, not the day you are heading out. But that said, emergencies DO happen. No matter how well you are at planning ahead, occasionally children wake up with fevers, basements flood, or your husband surprises you with a last-minute trip to Hawaii (I can dream, right?) and forgot to arrange a sub in all his planning efforts. Stake music leader - if you have this option in your stake, I would always utilize them first! The stake music leader usually wants to help with your calling and this is a wonderful way to have the stake music leader help you out. Primary presidency member - with no sharing time lessons to present, they are a little more open to help you with singing time on Sunday. Don't hesitate to call on one of them to help. Previous primary music leaders - if you previous music leaders, they would probably jump at a chance to come back to the world's best calling ;). Spouse/friend/relative - beg and plead with them as they will still have to love you after you've asked them to sub for you! If you've tried these options with still no luck, contact your primary presidency to have them figure out something for you. They should understand that this can be a tricky calling to find a substitute for. You should be able to rely on your primary presidency back you up when you truly need them in the circumstance that you absolutely cannot find a substitute. It might even help you and your presidency to sit down and create a singing time leader substitute list. Go through the list I created above, branching out to other ward members who might be available to substitute for this calling. Or together, create a back-up plan of what to do if no substitute can be found. So, you've finally lined up a substitute - what a saint! Now what? Do you hand off a lesson or do you let them do what they want? I personally would give them the choice as it depends on their experience with teaching singing time and what they ultimately want to do. I try to cater to them as much as possible as they are doing me a huge favor by substituting for me. Honestly, beggars can't be choosers. If you are asking a well-seasoned previous music leader, odds are they will just want to do their own thing. Maybe they will want to know what songs the kids are learning so they have some sort of a guide but want to determine the rest, as far as what activity to do. 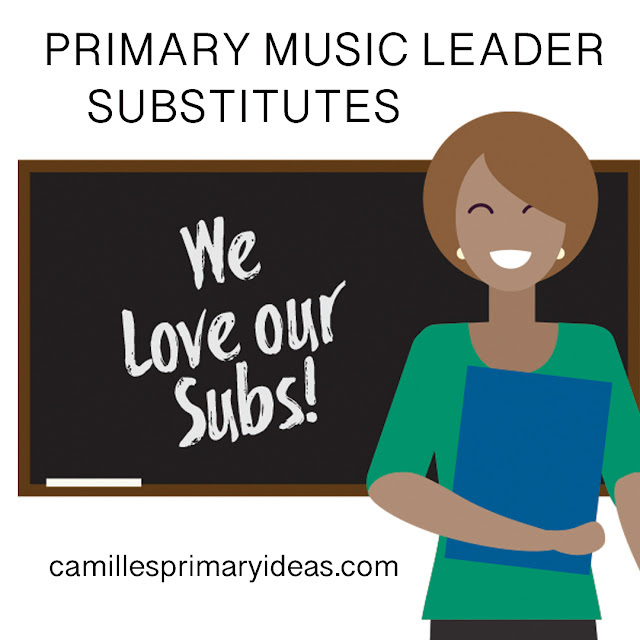 On the flip side, if you are asking someone who is very gracious to sub for you but isn't as comfortable leading singing time, or doesn't have time to come up with something on their own, I'd definitely ask if they'd like you to put together a lesson plan, for them to simply implement. Sometimes coming up with what to do is the hardest part of this calling! So do that hard part for them. And this calling can be tough if you've never done it before so it never helps to have someone else who knows what is going on, map out a plan of what to do. I've love to hear how you manage substitutes in your calling. Leave a comment with suggestions or ideas! !